Potato galettes make a nice alternative to the usual starches. They’re not as rich as the more often seen potato gratin. They’re not as fussy either. Easy to make, they’re always a hit. I like to serve them with poultry or roasted meat. A mandolin makes short work of slicing the potatoes. Be careful though. They make short work of fingertips as well. A good knife and some patience works as well. Try to pick potatoes roughly the diameter of your muffin tin. Makes things much neater. I like yukon gold potatoes for this dish. Try to rotate your muffin tins while cooking. Ovens have hotspots. Easy to make, these tasty potato galettes cook unattended while you are busy with other things. Heat a pan over medium low heat. Add the butter and onions or shallots and cook until they start to caramelize. Add thyme leaves, season with salt and pepper and cook one minute more. Peel and slice potatoes, 1/8 inch thick. Try to pick potatoes that are the same diameter as your muffin tins. Coat the muffin tins with non-stick spray. Layer each tin with two layers of potatoes. Season with salt and pepper. Add another layer of potatoes, then spoon 1/6 of the onion mixture in each muffin tin. 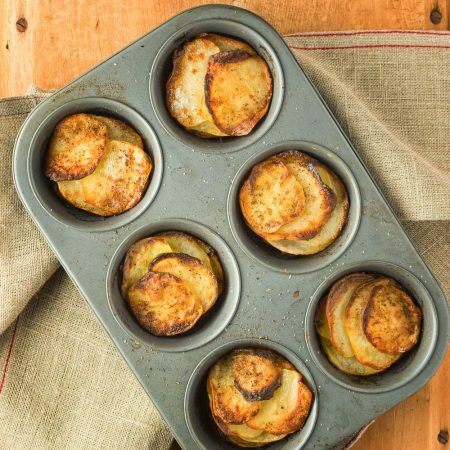 Continue adding potatoes and seasoning until you reach are even with the top of the muffin tins. Add one Tbsp chicken stock or water to each tin. Top each galette with 1 Tbsp butter. Bake, loosely covered with foil for 20 minutes. Remove foil and bake an additional 30 minutes or until potatoes are tender. To serve, run something thin and flat down the side of the tin and push the potato stack up, stabilizing it with your other hand (put your hand on the top of the galette). This is a little tricky so take your time. I love my muffin tins AND potatoes! This simple potato galettes recipe looks and sounds so delish! I’m always looking for new ways to make yummy sides, can’t wait to try these! It’s fun to play with things in ways they weren’t originally intended for. I’m thinking of pulling out the waffle iron next to see what I can do with that! This is SUCH a great idea! I love eating potaoes for breakfast and I’m always looking for new ways to cook them! These are so pretty and easy to make! I love anything that I can just throw in the oven and leave to cook, especially in the mornings when I have 60 billion things to do. Pinned! I’ll be making these soon! They are really handy that way. Just set and forget. They are great as a starch on the plate for dinner as well. I actually never thought about using them at breakfast so thanks for the idea!